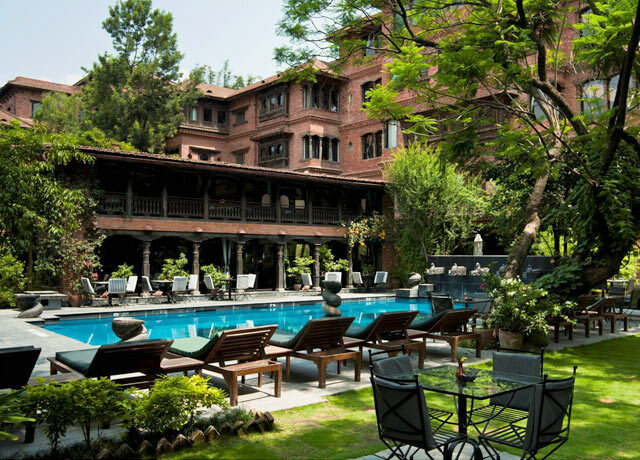 This award-winning heritage hotel in Kathmandu is modeled on the grand palaces of Nepal's Newar kings, featuring intricate carved wood and terracotta, antiques and contemporary amenities. 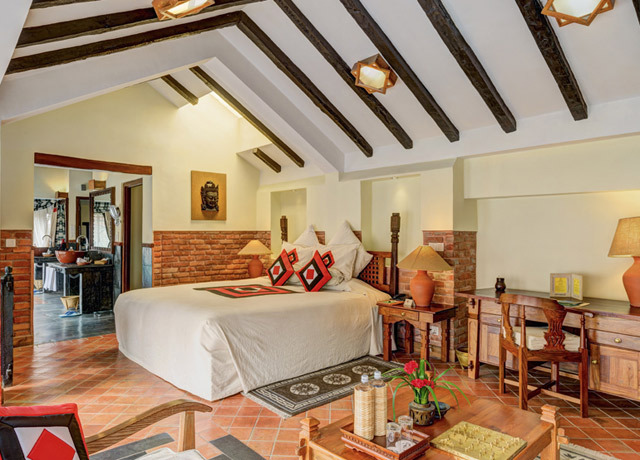 The Dwarika's Hotel is an award-winning heritage hotel that takes its inspiration from the Kathmandu Valley's rich history and cultural traditions. 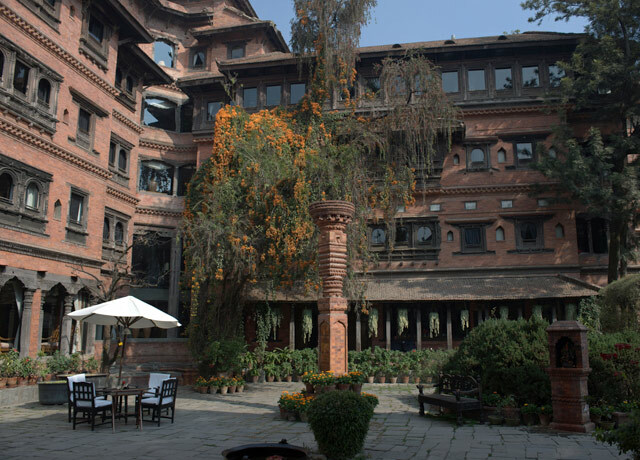 Modeled on the architectural grandeur of the palaces of the Newar kings, the hotel houses an extensive collection of artifacts dating to the 14th century, with intricate carved wood and terracotta work by the finest craftsmen in Nepal. Its 87 rooms and suites are meticulously designed to offer an experience that is both aesthetic and comfortable. 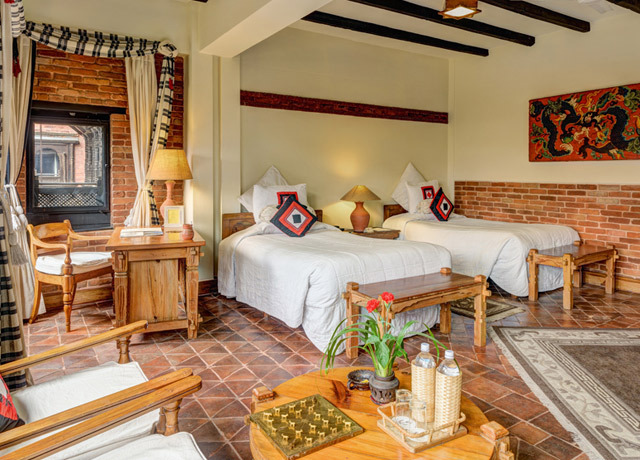 Rooms combine traditional Newari decorative motifs and antiques with the contemporary amenities of a luxury hotel. Dark hardwood beams and tile floors provide the setting for beds featuring handwoven organic linens, and custom handmade furniture that showcases exquisite woodcarving. The hotel's three restaurants and bar serve continental and multicultural cuisine, prepared with fresh-picked vegetables from The Dwarika's own farm. For relaxation, enjoy the cozy library, swim in a pool reminiscent of 12th-century Malla dynasty baths, take a free yoga class, or indulge at the Pancha Kosha Spa, where you'll find a range of massages that draw on ancient Himalayan treatments. 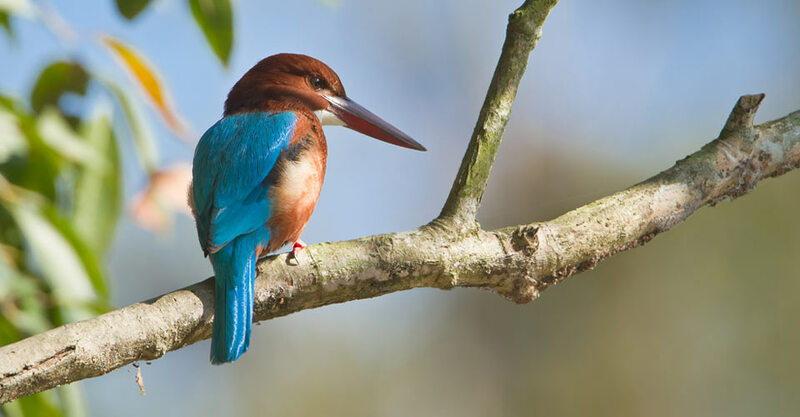 An elegant safari lodge in the heart of Nepal's Terai lowland jungle near Chitwan National Park, 16 luxury riverside villas with private plunge pools offer a soothing sanctuary in the heart of the jungle. Meghauli Serai is an elegant safari lodge in the heart of Nepal's Terai lowland jungle with exceptional proximity to Chitwan National Park. 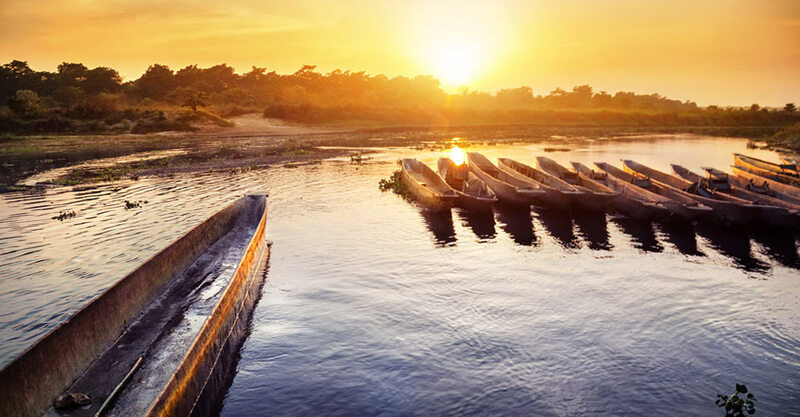 Perched on the edge of the Rapti River, the property melds its lush natural setting with fine guest accommodations to create a serene escape from the everyday. Sixteen luxury riverside villas with spacious living areas and views of the park across the river offer a soothing sanctuary in the heart of the jungle. 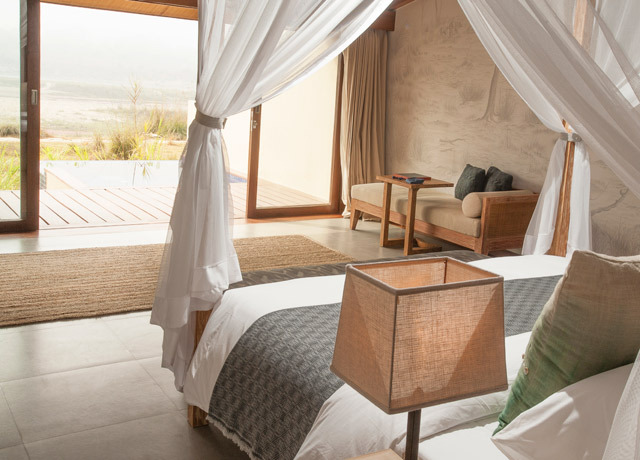 Each villa includes a private plunge pool, air conditioning and en suite bathrooms adorned with traditional Nepalese stone spouts. 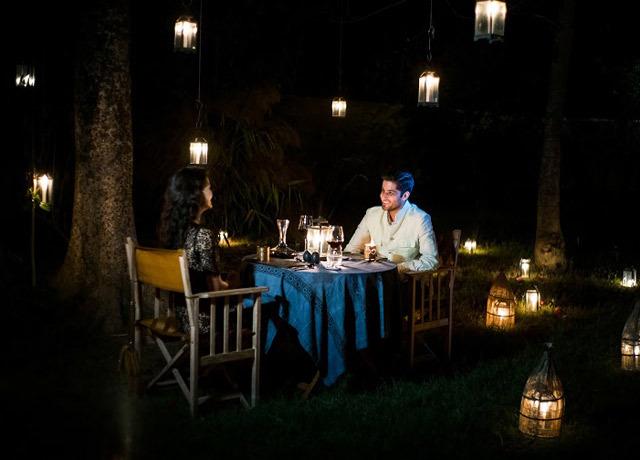 Meghauli Serai offers a range of dining options. 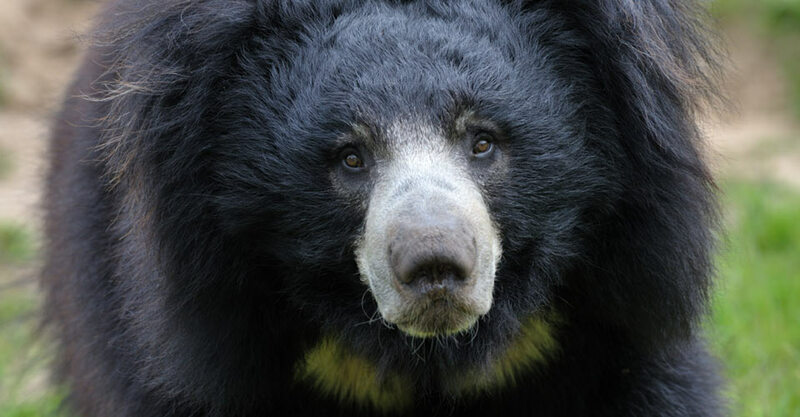 Guests can share stories of wildlife sightings over a communal dinner around a bonfire or enjoy a more private dinner in the dining room, on the river viewing deck, in their room or next to the pool. Specializing in Newari and Tharu cuisine, the chef prepares fresh food with an authentic local flair using organic fruits and vegetables grown on the premises. After each adventurous day in the outdoors, guests can enjoy a cocktail at the bar and lounge, take a dip in the infinity pool or indulge in a range of soothing spa treatments and massages. 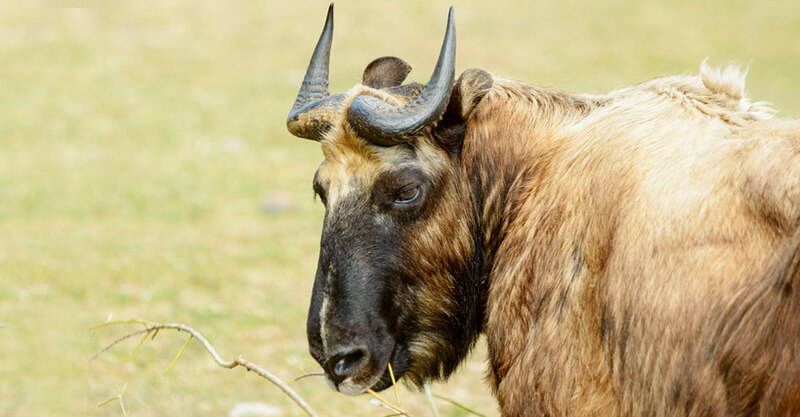 From its prime position within the wilderness, the lodge offers excellent opportunities for spotting wildlife−like the one-horned rhinoceros and gharial−directly from the property. 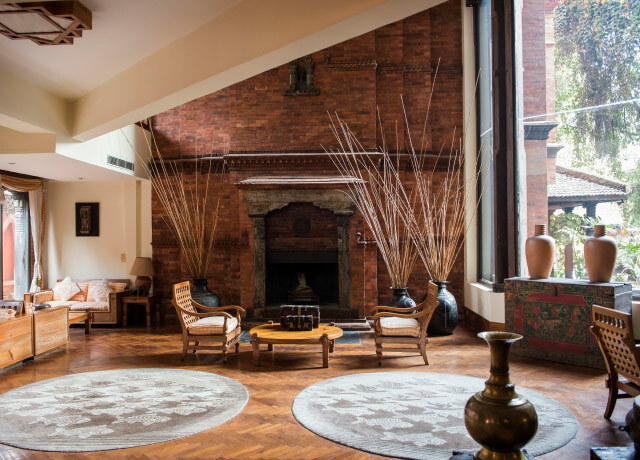 Centrally located in Bhutan’s capital city of Thimphu, the hotel’s harmonious blend of traditional dzong architecture and modern design creates an elegant space resonant with Himalayan tradition. 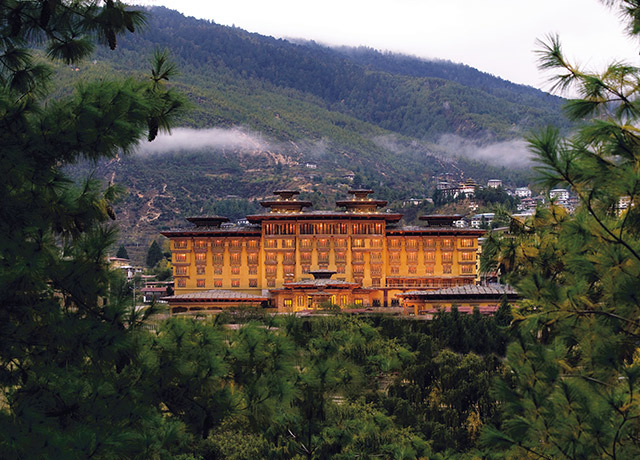 Centrally located in the capital city of Thimphu, the exquisite Taj Tashi is one of Bhutan’s finest hotels. 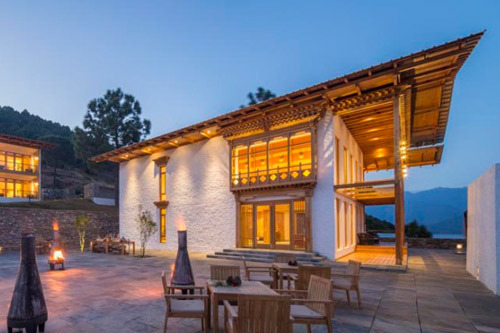 A blend of traditional dzong architecture and modern design creates a distinctive space in harmony with the country’s deep Himalayan traditions. Guest rooms are adorned with hand-painted murals of swirling clouds—a recurring motif in Bhutanese art—and take in sweeping views of the surrounding mountains. Elegant, expansive and luxuriously appointed, the rooms pamper guests with the finest amenities, including large bathrooms featuring warmed floors and heated towel bars. And for a real indulgence, try the Bhutanese hot stone bath at the hotel’s Jiva Spa. 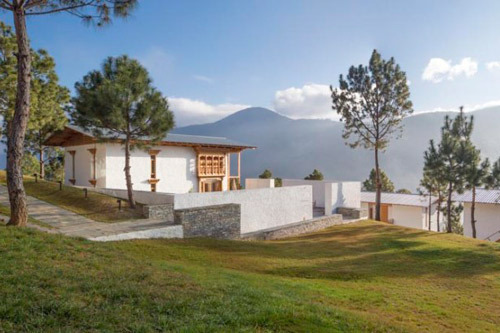 In the heart of the Punakha Valley, modern design meets Bhutan's peaceable principles with private balconies for solitude, a glass-enclosed dining area and a broad stone terrace for fresh mountain air. 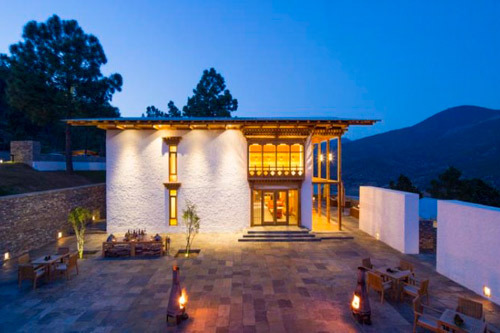 Dhensa Boutique Resort is an elegant small hotel in the heart of the verdant Punakha Valley. 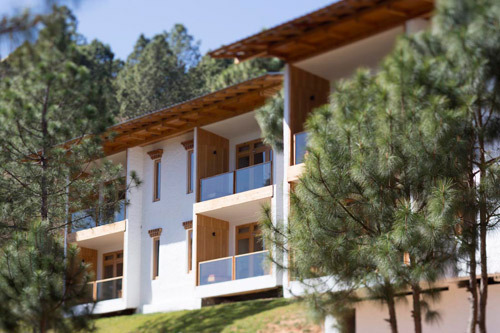 Marrying contemporary design with the ancient and peaceable principles that define Bhutanese culture, Dhensa Punakha provides guests with soothing accommodations and modern amenities. Six individual cottages house four guest suites each, all with private balconies for relaxing in solitude. Understated interiors have comfortable beds with luxurious cotton bedding and en suite bathrooms with soaking tubs. Complimentary wireless Internet access is provided. 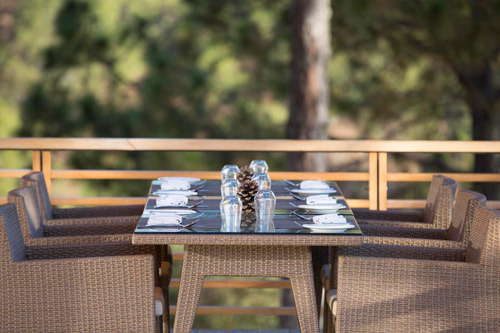 Fine meals are served in the glass-enclosed dining area with panoramic views of the valley, or in the fresh mountain air on the broad stone terrace. Seasonal, local and organic produce is incorporated into a creative menu that features Asian, Bhutanese and Western selections. 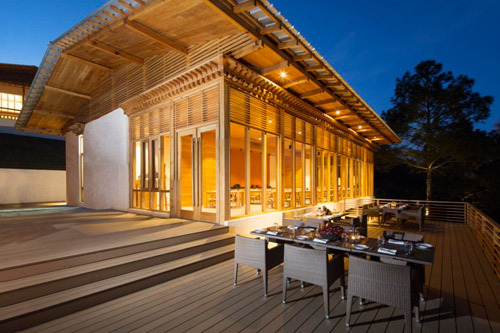 The Dhensa Spa, set in its own cottage with windows onto the forest, offers a haven for relaxation and rejuvenation. Partake in yoga, spa treatments featuring hand-blended essential oils, sauna, steam room and a unique outdoor wood-fired bath. 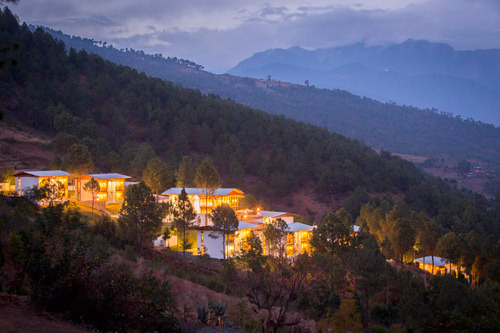 Flanked by thick pine forests and surrounded by numerous walking trails, Dhensa Boutique Resort overlooks the Punakha River and hundreds of rice paddy fields that terrace down to the valley floor. 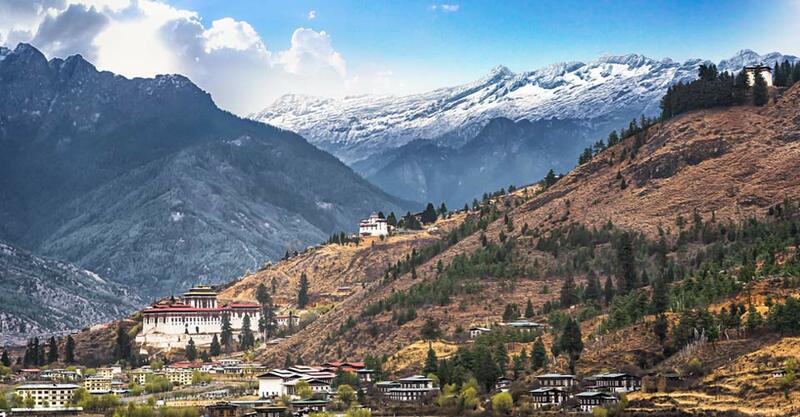 Contemporary luxury and traditional Bhutanese design meld within this 59-room riverfront hotel that offers expansive views over the Paro Valley with its ornate monasteries and sacred fortresses. 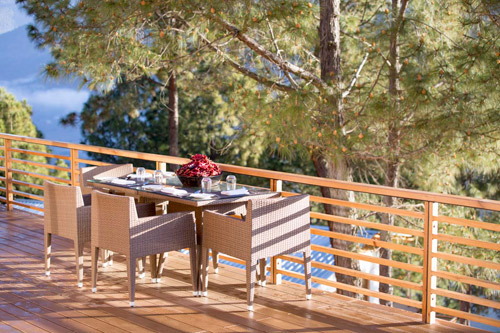 Modern luxury and traditional Bhutanese elegance are married into this riverfront hotel with 59 smoke-free rooms and expansive views over the Paro Valley. 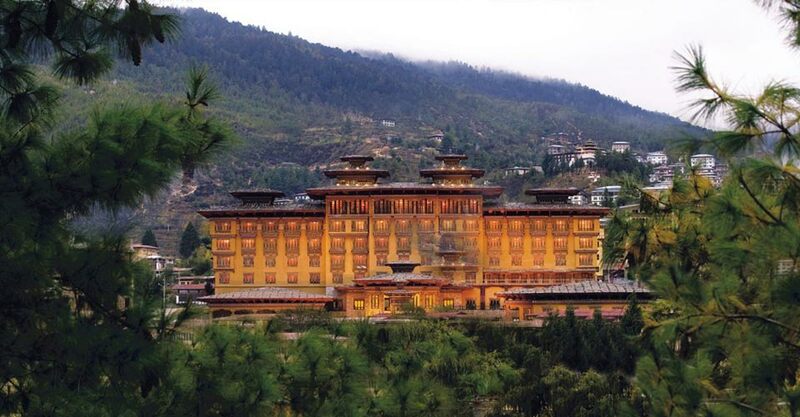 Located a half-hour outside Bhutan’s capital, Thimphu, the hotel sits at the edge of the Paro River in a region noted for its rich history, ornate monasteries and sacred fortresses. Le Meridien Paro is an ideal place from which to explore living Bhutanese culture, find artful handicrafts and taste the regional cuisine. Sleek modern amenities complement the resort’s locally inspired atmosphere, including delicate carving, gold embellishments, bright splashes of color and distinctly Bhutanese architecture. Rooms have wall-to-wall windows that overlook the Himalayas and garden and a daybed under the window lets you nestle in and soak up the expanse of the world’s highest mountains. Hardwood floors, wood veneer walls and turquoise accents that evoke the Paro River are complimented by a large Buddhist prayer wheel on the wall of each room. Contemporary beds feature crisp, white bedding and grey padded headboards, and each marble en suite bathroom includes a glass-enclosed rain forest shower and separate soaking bathtub with handheld wand, signature bath amenities, plush bathrobes and slippers. Each room has a 40-inch LED TV and coffee and tea maker, and high-speed internet access is available for a fee. On-site, enjoy an indoor saltwater chlorinated, heated pool, outdoor whirlpool hot tub fitness center with inspiring views of the Himalaya, three restaurants and a chic, contemporary spa. 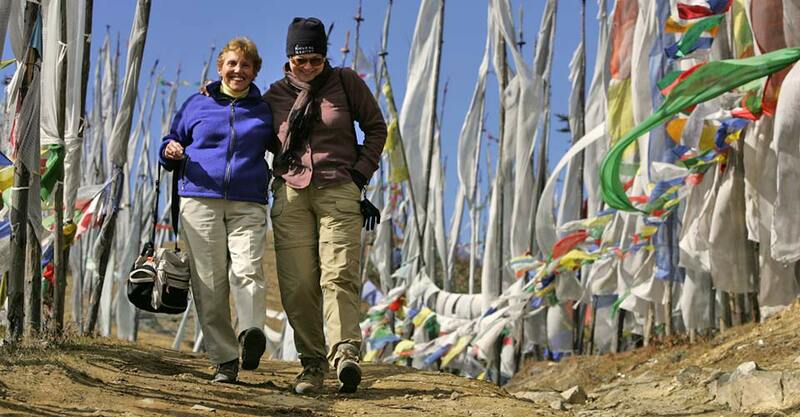 Fill out the form below to receive additional information about our Himalayan Jewels: Bhutan & Nepal. 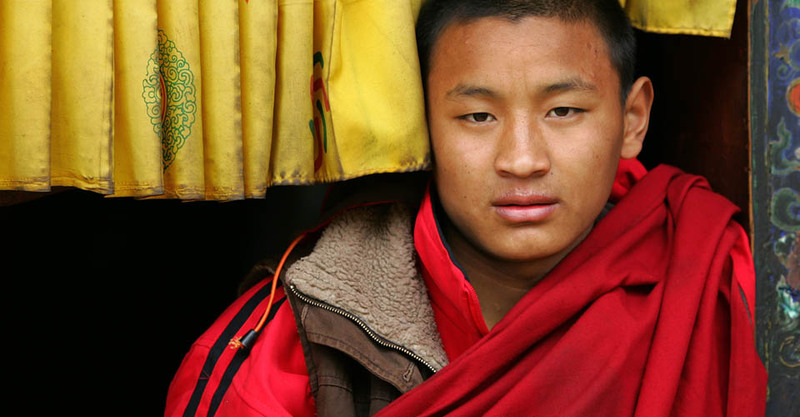 Hi Nat Hab, I’m interested in your Himalayan Jewels: Bhutan & Nepal. Can you please contact me with more information?